PRESIDENT Lungu yesterday launched Mukuba Mall in Kitwe with a directive to all supermarkets to also retail Zambian-grown agricultural produce and other local products. The President said there is no reason why Zambian-grown tomatoes, potatoes and other produce should not be given sufficient shelf space in supermarket chains that benefit extensively from Government investment incentives. “I will personally be making surprise visits to supermarkets and similar retail outlets to check on their compliance to this directive. “To all those who think these are empty threats, please take me on,” Mr Lungu said. President Lungu said the development of retail spaces, including shopping malls, opens up opportunities for growth of local suppliers and entrepreneurs in other sectors. He said local businesses are able to grow and create more jobs in sectors like agriculture, transport, tourism and arts, among others. “I am reliably informed that the Mukuba Mall and Kafubu Mall group is currently developing two more shopping malls in Solwezi and Lusaka, respectively, and works are progressing well. “It is indeed encouraging to note that the total direct investment into these mall developments is currently over K1 billion,” he said. The President reiterated his commitment to developing the country. “Apart from the investment and economic activity anticipated in these developments, there are over 1,000 jobs that have been created during the construction phase of the shopping malls. 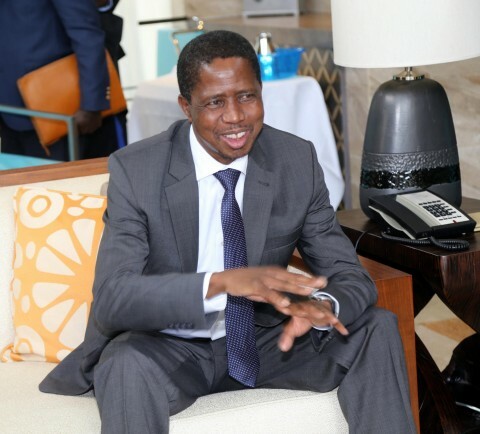 This is in addition to thousands of jobs and service skills development opportunities for our youth that will be created in the retail and service industry over the long term,” Mr Lungu said. The President said Government is aware that the domestic economy is always spurred by a healthy or robust consumer base. “Our communities have grown and transformed over the years as we are indeed witnessing an accelerated growth and diversity in the consumer base,” Mr Lungu said. He said the development of the mall has resulted in higher demand for goods and services that are not only competitive in quality but also in prices and accessibility. He ordered the Ministry of Commerce, Trade and Industry to ensure that locally-produced goods and services meet the challenge. “Having grown up here in Kitwe, I have a strong personal recollection of the limited retail amenities that were available and accessible to us,” he said. He commended the developers of Mukuba Mall for taking advantage of the good investment climate in the country. “It is an established fact that such commercial developments give sound confidence to investors in the strength and growth of the Zambian economy and is an assurance that investing in Zambia continues to make good business sense,” he said. Mr Lungu encouraged all mall developers and operators to work with the Ministry of Commerce, Trade and Industry to develop more inclusive rental pricing structures that encourage local tenancy in the malls. President Lungu said Government, remains committed to supporting the growth of the local industry and micro and small to medium-scale enterprises. He also said Government through the Ministry of Commerce, Trade and Industry and the Citizens Economic Empowerment Commission, is working on a policy that will protect and support the growth of local participation in all economic sectors. “I also urge local entrepreneurs to study and take advantage of the opportunities that have been rolled out through the launch of this development,” he said. Mukuba Mall chief executive officer Steve Herring described Zambia as a land of opportunities. Mr Herring commended various stakeholders, including Kitwe City Council for their support during the development of the mall. He said the mall is the largest trading facility on the Copperbelt. President Lungu was accompanied by Copperbelt Minister Mwenya Musenge, special assistant for press and public relations Amos Chanda, special assistant for political affairs Kaizer Zulu, State House Deputy Minister Mulenga Sata, deputy ministers, Patriotic Front members of the central committee, Copperbelt permanent secretary Howard Sikwela, district commissioners and mayors and other senior Government and party officials.